Many of the world's largest retailers have clothes made in Bangladesh. That's because just about all, or 98%, of clothes sold in the U.S. are made overseas, according to the Apparel and Footwear Association. Also, companies don't tell consumers if any of their suppliers violate safety standards. 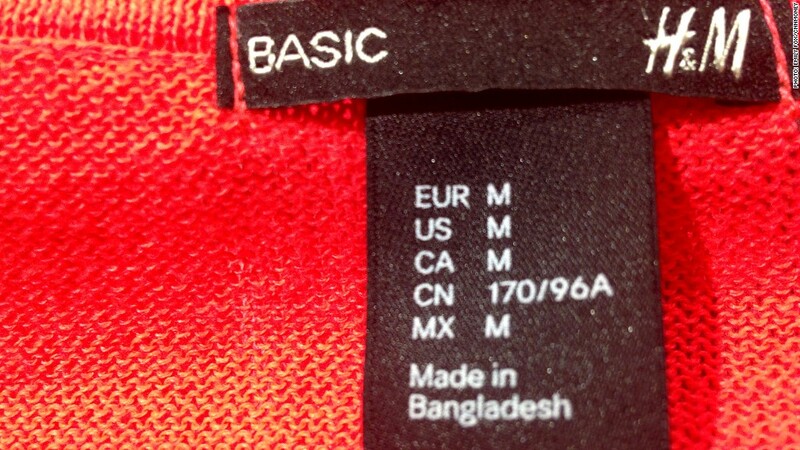 A very large portion of U.S. apparel imports comes from Bangladesh. Many companies have been shifting orders there, because labor costs in the country are so low. Bangladesh is on track to surpass China within the next seven years as the largest apparel manufacturer in the world. It is already the third biggest exporter of apparel to the US., behind China and Vietnam. The value of clothing imported from Bangladesh into the U.S. has quadrupled over the last decade to $4.5 billion annually, according to the apparel group. Bangladesh has about 4,500 garment factories that make clothes for global retailers, including Gap (GPS), H&M, Wal-Mart (WMT), J.C. Penney (JCP) and Sears (SHLD), as well as smaller retailers like Benetton, The Children's Place (PLCE) and Joe Fresh. Many large companies, including Wal-Mart, J.C. Penney and Sears, have supplier guidelines on health and safety standards. They set expectations for working and building safety conditions, wages and labor practices that their suppliers must meet. The retailers claim they conduct audits to ensure their suppliers are complying with standards. Experts say the problem is that the results of these audits aren't made public, so it's hard to hold the stores accountable. There is no way for a consumer to know if a company is actually conducting the audits or terminating relationships with suppliers who don't meet standards. "In terms of the factory and the factory conditions where an item is made, the consumer has no information, the audits are never made public and that's how retailers want it," said Scott Nova, the Workers' Rights Consortium's executive director. This is also true for retailers who invest money and publicize what they do to monitor suppliers. Wal-Mart made a big public push earlier this year for its compliance program, saying it conducts thousands of audits each year and that factories will have to pass audits before they are allowed to do business with the retailer. But last week, Wal-Mart would not say if any of the factories in the collapsed building had been audited. "Companies don't want consumers to understand the reality of what's going on -- the labor abuses, the low wages -- that make products for the U.S. market," Nova said. "Customers do care, but they don't have enough information about where and how products are made to react."